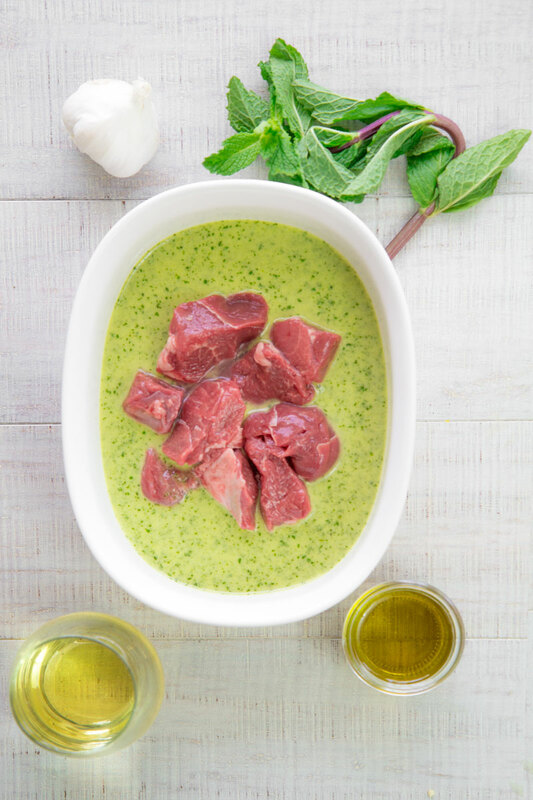 Greek lamb stew marinated into a fresh in taste mint Salmoriglio is a perfect recipe to survive the winter and let you feel immersed in a Mediterranean summer! 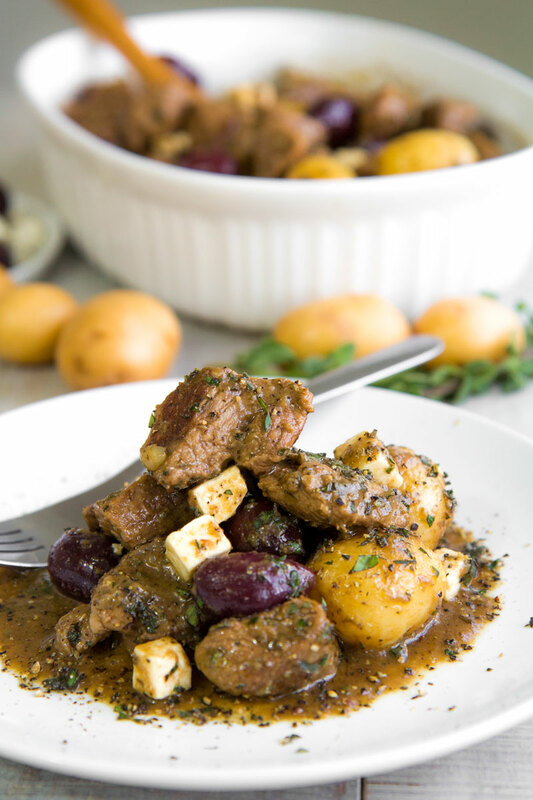 Whole baby potatoes, Kalamata olives, and feta cheese donate a delicious flavor to the meat; try it on and let me know what you think! 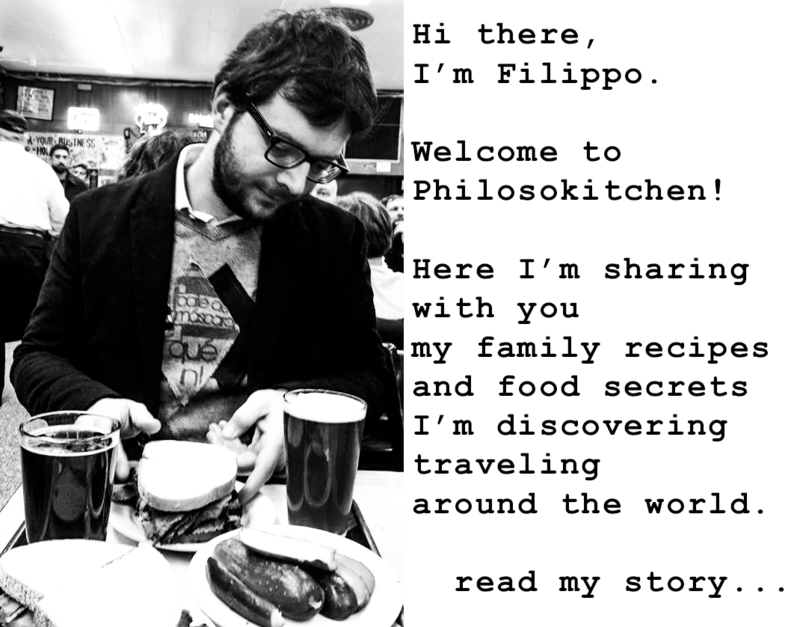 First of all, prepare a special Salmoriglio marinade with mint and white wine (click here and read all you need to know about Salmoriglio!). 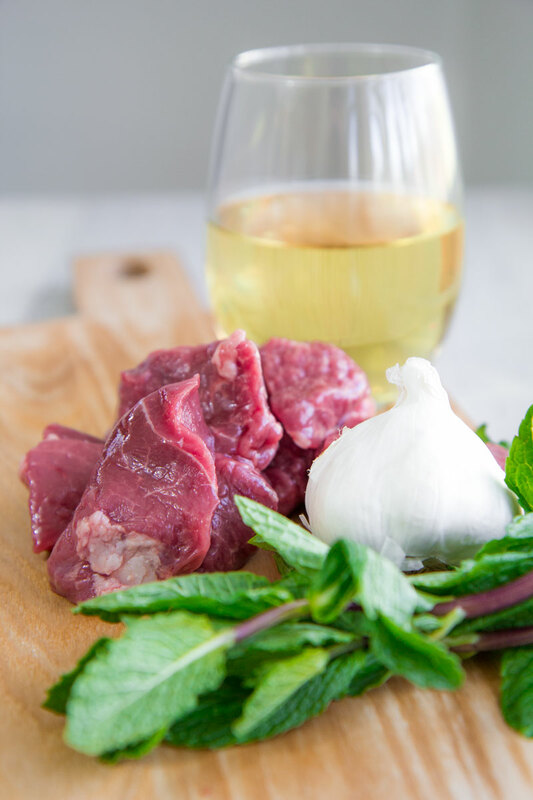 Just combine 1.25 cups of white wine with 1.25 cup of warm water, and 1.25 cup of extra-virgin olive oil, and 8 tbsp of fresh mint leaves, and 1 peeled clove of garlic. Now, blend the mixture until smooth and consistent. 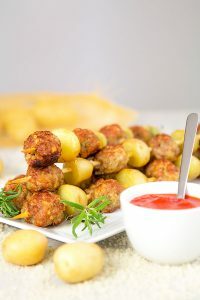 Reduce the lamb meat into pieces same size of baby potatoes, then pour them in a bowl along with Salmoriglio marinate. Cover with plastic wrap and store in the fridge at least 8 hours up to 1 day. Once the meat is well marinated, raise it from salmoriglio and pour in a colander. 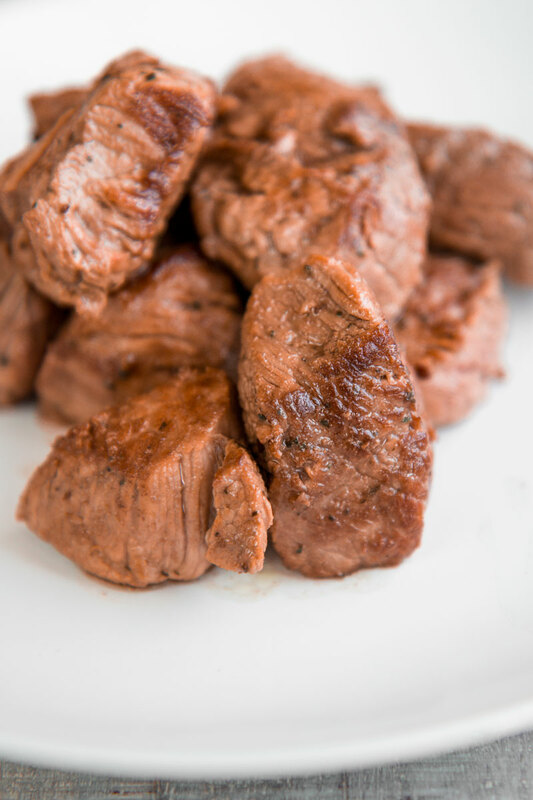 Pour the marinade into a pot along with the rest of the wine, and place over low heat until starts to simmer gently. Now, sear the lamb a few pieces at a time into a thick-bottomed heavy pot until golden brown. Eventually, pour the lamb and marinade into the heavy pot, cover with a lid and set the flame in order to let the Greek lamb stew bubbling 1 hour very gently. Meanwhile, the meat is slow-cooking, rinse the baby potatoes. Now you have to choices. The first one is peel the potatoes and poach them in boiling water 3 mins. 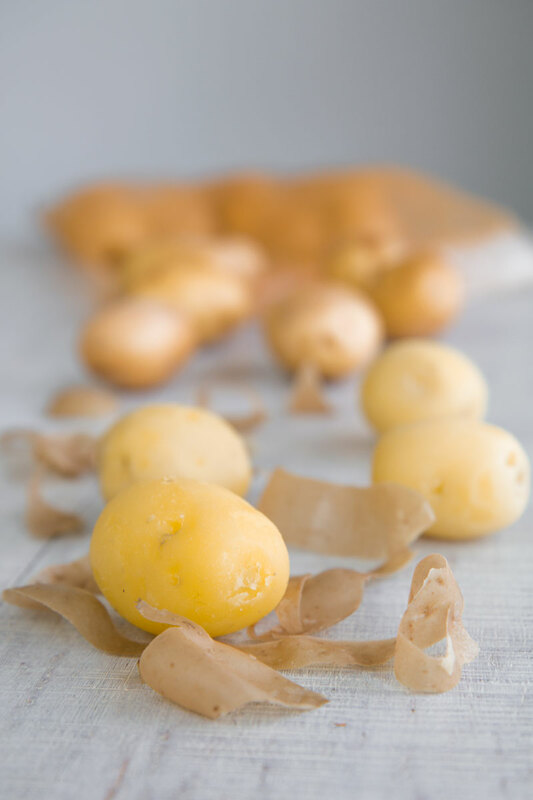 The second choice is to pour the potatoes unpeeled into a pot along with room temperature water, place over medium heat, and cook 3-5 mins after the water starts to boil. Finally, incise the potatoes and peel with your hands. Personally, I prefer the second choice in order to preserve the rounded shape of the potatoes. After 1 hour, add the potatoes and kalamata olives into the pot and cook 1 hour mote or until the potatoes are well done, but still in shape. 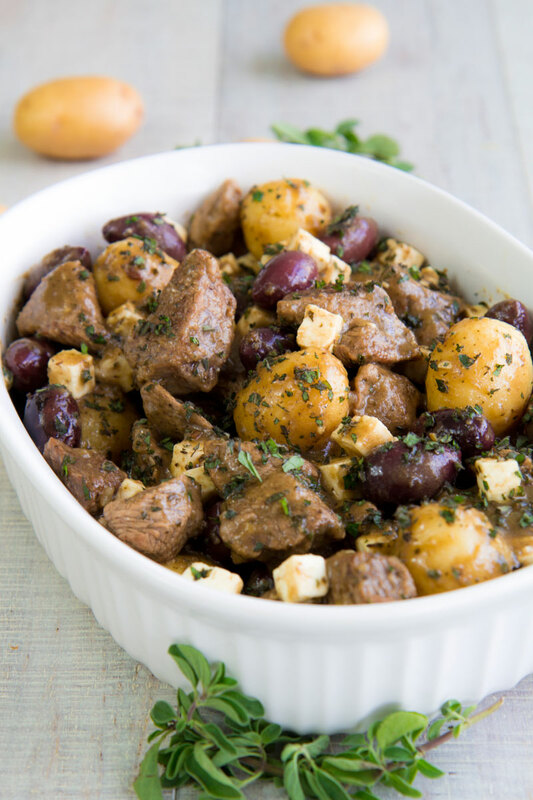 Once ready, raise the meat, and potatoes, and Kalamata olives with a slotted spoon. Now, sift and pour the cornstarch into the sauce a little at a time, stirring and raising a bit the flame. 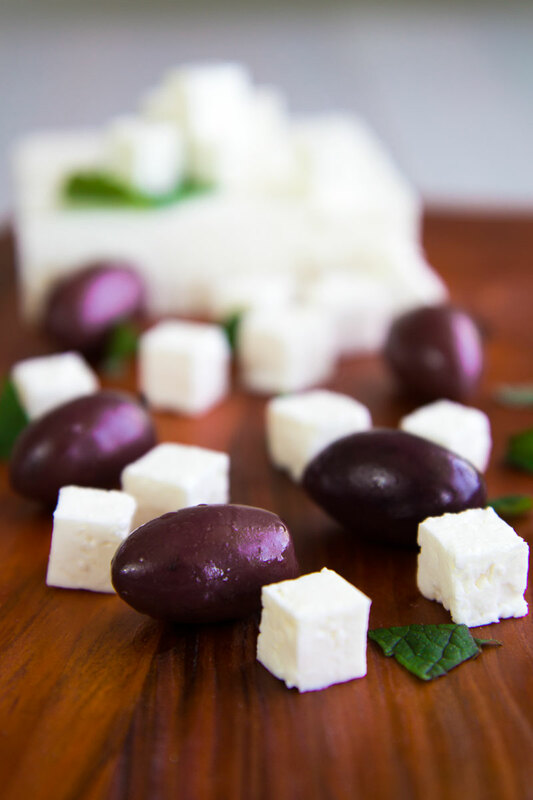 Cook and stir until the sauce is thick and creamy at your preferred grade; add diced feta cheese 3 minutes before ready. Finally add meat, potatoes, and olives, then add 2 tbsp of minced mint and serve the Greek lamb stew hot.